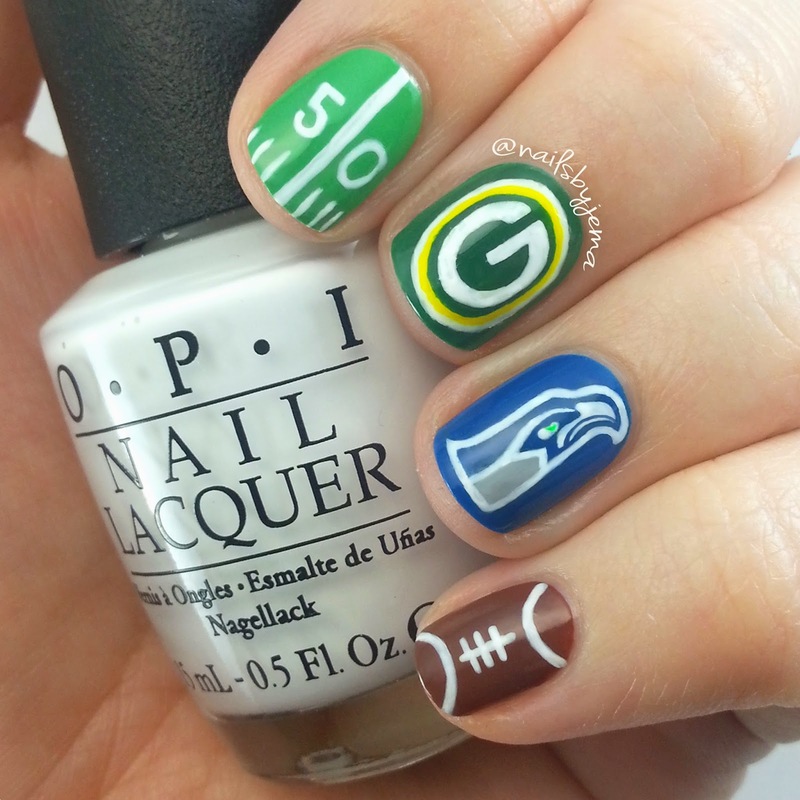 N A I L S B Y J E M A: Football Nails!! So, I kinda like watching NFL. Even as an Aussie it's my chosen football to watch. The hits are massive, the plays are technical and the players are hot! These were done for the first game of the season which one of my two teams played in. GREENBAY! Unfortunately they lost, but first game loss against last years champions is still a win for me since they held their own! I used Essie 'The More the Merrier' and my trusty white gel pen for the field marking index nail (the 5 and 0 stained my nails permanently for some reason...), Kleancolor 'Cappuccino' for the base of the football nail and my gel pen for the white lines, Ulta3 'Frog Prince' for the base of the Greenbay Packers nails and Rimmel 'Bluetiful' for the base of the Seattle Seahawks nail. The rest I did with acrylic paint, gel pens and nail art brushes. 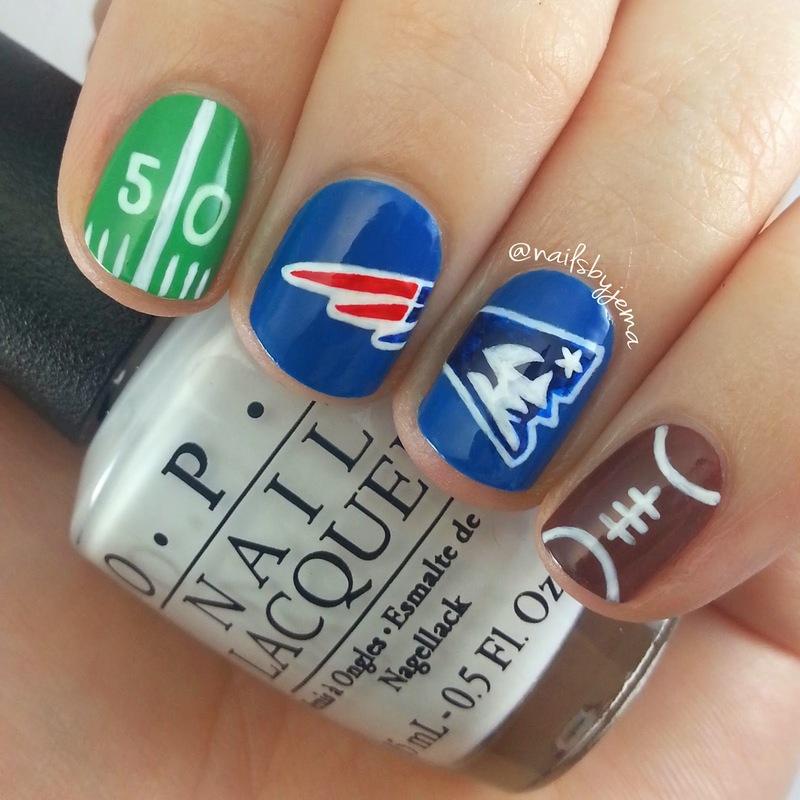 The next set of nails I did for the Patriots first game on Sunday. They played the Dolphins. They lost. It was all very confusing. I re-used my football and field marking nails and redid the middle nails to make life easier. I had NO idea how hard doing the Patriots logo was going to be until I started. Pats, why is your logo so difficult?? I thought the face was going to give me the most trouble and so I got really focused on it.. and then forgot to leave heaps of room for the star! Oops! I used a base of Rimmel 'Bluetiful' again and then did the entire logo with acrylic paint. LOVE them.